Swedge is a quick, interactive and simple to use analysis tool for evaluating the geometry and stability of surface wedges in rock slopes. Wedges are defined by two intersecting discontinuity planes, the slope surface and an optional tension crack. Swedge provides an integrated graphical environment for fast, easy data entry and 3D model visualization. Swedge offers an extensive array of analysis options including Deterministic, Probabilistic, Combinations, Sensitivity, and Persistence analysis. 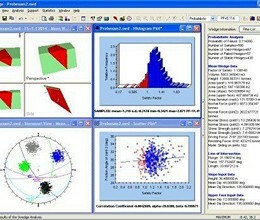 For a Deterministic analysis, Swedge computes the factor of safety for a specific wedge. For a Probabilistic analysis, statistical input data can be entered to account for uncertainty in joint orientation, strength and other parameters, and a probability of failure is calculated. For a Combination analysis, any number of joint planes can be defined, and Swedge will compute all possible combinations of joint intersections which can form a wedge. Rock bolts, shotcrete or support pressure can be applied to increase the wedge safety factor. De-stabilizing forces due to water pressure, seismic loads or external forces can also be easily modeled. Joint shear strength options include Mohr-Coulomb, Barton-Bandis or Power Curve models, and a joint waviness angle can be defined. Swedge provides improved integration with the Dips program. 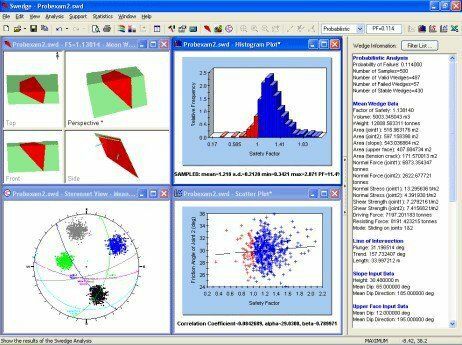 A complete Dips file can be imported into Swedge and analyzed with the Combination analysis option; or statistical joint set information (Fisher Distribution) can be imported for a Probabilistic analysis. * Swedge download link provides trial version of the software. RocPlane is an interactive software tool for performing planar rock slope stability analysis and support design. Swedge has been rated 3.0 out of 5 points. A total of 2 votes cast and 0 users reviewed the software.